When Amir Khan said that the key to defeating Mayweather is speed and movement, a popular notion pushed by astute followers of boxing, Mayweather slapped him the face with the selection of Andre Berto. For Mayweather emphasized in the promotion that Berto is “athletic” and “has good hand speed.” The caveat was that Berto was small in stature and his arms too short to reach Mayweather. Never feinting Mayweather out of position, Berto's hands were only as quick as his feet. Berto's hands speed was irrelevant so long as he had to use his legs to get to Mayweather, similar to how Vasyl Lomachenko neutralized Gary Russell's fast hands by controlling the range of the fight with his feet. The ultimate flaw with Berto was that he let Mayweather control him by expecting to land after just one or two punches. He tried to use his jab to set up his overhand right. Expecting it, Mayweather usually slipped underneath the right hand without fear of Berto following up with anything else and even falling into Mayweather to smother his own punches and allow Mayweather to tie him up. In other words, Berto exhibited great speed and athletic ability but within the confines of a very limited and predictable arsenal. Mayweather's ring intelligence lies in pattern recognition, not only in recognizing tendencies of a single opponent, but observing common trends among all of his competitors. We saw Maidana surprise Mayweather with a right hand following a lazy jab that sent Mayweather off balance into the ropes. Prior to that, he had repeatedly countered Maidana's jab because he had expected it, without a right hand proceeding it. When Mayweather said that Maidana was “awkward,” it meant that he had difficulty anticipating Maidana's strikes. Berto never surprised Mayweather by throwing the right hand straight, establishing the left hook or uppercut to set up the right hand, doubling up on the right hand, occasionally stepping back as Mayweather moved forward to tie him up. Whereas Maidana confused Mayweather with looping shots, Mayweather made the adjustment in the rematch by smothering Maidana and tying him up. Maidana never adjusted by occasionally straightening his punches and stepping back so, caught by surprise, Mayweather walked into a straight punch while attempting to get inside of one widely thrown. Oscar de la Hoya wrongfully stated that Mayweather cannot block a jab, therefore Manny Pacquiao would easily land his straight left hand. In fact, Mayweather got hit with the jab because it caught him by surprise as he guarded against more powerful shots. With Pacquiao, the primary threat was his straight left hand, thus Mayweather anticipated it and Pacquiao had no success with it. Berto is said to have a good jab. On the contrary, his jab is fast, but it is thrown in the same manner, without regard for distance, angle, or to set up other punches. Overall, Mayweather showed that Berto is a great athlete but is not tactical. Winning nearly every round, Mayweather did manage to hurt Berto on several occasions with a counter left uppercut as Berto leaned in. Otherwise it was a replay of Mayweather-Pacquiao. 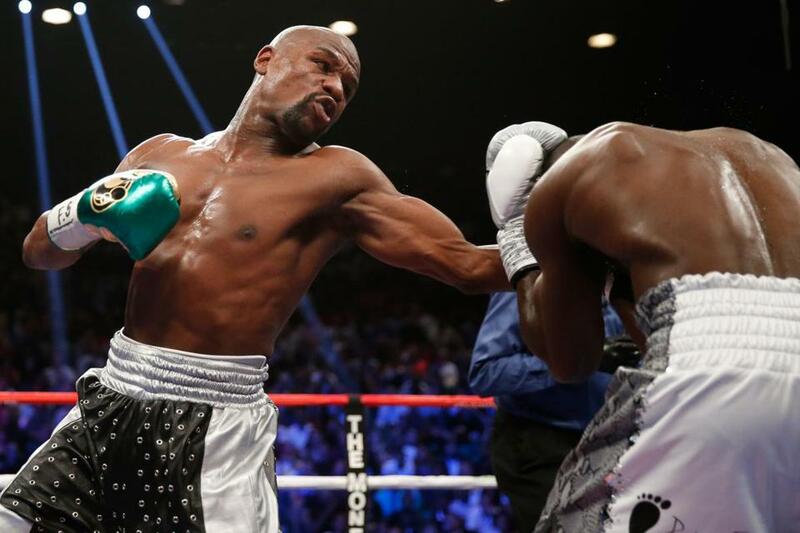 Floyd Mayweather won by unanimous decision to extend his record to 49-0 with 26 knockouts. There is talk of Mayweather not retiring because the money will entice him. I disagree. If Mayweather is moved by money, it is not money for money's sake but the opportunity to break into new territory by becoming the first billionaire earner in the sport of boxing. With it widely being cited that Mayweather has earned around $700 million over his career, perhaps he can exert so much control over a Pacquiao rematch that he can get a guaranteed $300 million and break Rocky Marciano's record which he has now tied. Mayweather is only driven by breaking records, not money.